Looking for the very best anniversary gift? Say “I Love You” with a basket! Let’s face it, most of the time picking out an anniversary gift can be more difficult than picking out a birthday gift. Even after being in a relationship for years and years with a person and knowing them like the back of our hands, we all still get nervous when our anniversaries roll around. Sure, we may know exactly what our partners would like, but which gifts send the message of love and appreciation in the most effective way? Whether it is actually your anniversary coming up and you are looking for the perfect gift for your other half, or you are searching high and low for an anniversary gift for a special couple in your life, we are here to help. We have decided to concentrate on one of the most romantic gift ideas of all: gift baskets! Because not only are gift baskets really fun to receive, but they also have endless possibilities. In order to make choosing an anniversary gift for your loved one(s) a must easier task, we searched far and wide for the very best baskets out there. Sometimes the best way to say “I Love You” is with a basket of gourmet cheese and meats, other times its with a basket of assorted craft beers. You know the person you’re buying for better than anyone else, which is why we know that you are sure to find a basket that they will love. Use the menu below to find exactly what you are looking for quickly! So, your anniversary is coming up soon and you still have no idea what to get for her? 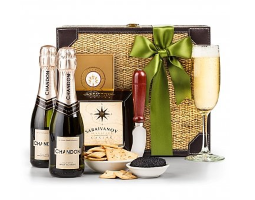 Our list of gift baskets begins with some of the best gift anniversary gift baskets for her. Whether she enjoys time to herself for relaxation, appreciates the way flowers brighten up the room, or absolutely enjoys digging into some of her favorite foods, you are sure to find a gift basket that your lovely lady will adore! Om… This is the gift basket for the woman in your life who could use a day of relaxation and meditation. This basket comes filled with sweet organic fruits, both fresh and dried, as well as yummy organic maple soy glazed nuts. She will love munching on these healthy snacks before her workout or yoga class. As a bonus, it also comes with a BPA free adorable water bottle, a cotton yoga strap for stretching, and a yoga eye pillow used for relaxation and meditation. Your lady will appreciate the fact that you thought of her love for working out and staying fit. There are few things as cozy and romantic as sleeping in on a Sunday and making breakfast together. With inspiration from the hearty breakfast of a rustic bed and breakfast, this box sends a sweet message that will be hard to match. The basket contains Farmhouse pancake mix, with New Hampshire maple syrup and wild Maine blueberries for a fresh, sweet flavor. Also included is Wild Maine blueberry jam, country ham biscuit slices, and an assortment of gourmet coffees. 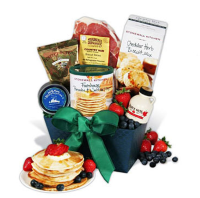 Send this basket to her just in time for your anniversary, and make breakfast together before starting your day. Give her the gift of a relaxing spa day right in your home! This gift basket is stuffed to the top with all kinds of snacks for her to enjoy, including butter pretzels, toffee peanuts, chocolate wafer squares, lemon cookies, biscuits, chocolate cream puffs, and more. Set the mood for her with the purple-themed spa items in the basket, including: a relaxation spa CD, a bath brush with a wooden handle, lavender bath salts, body lotion, body spray, bath soap, a scented candle, and much more! You can even join her, which makes for a fun stay-at-home-anniversary idea. Does your girl have a sweet tooth? 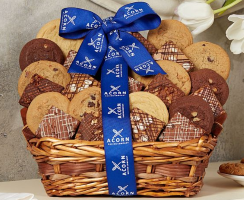 There’s no better way to show your appreciation for someone than by sending them a huge basket filled with all kinds of cookies and brownies! The different cookies included in the basket are chocolate chip, fudge nut, peanut butter, double chocolate, and oatmeal. The brownies are also assorted, making for lots of new flavors to taste. The best part? You get to eat some too… unless she eats them first! There’s no way to say “I Love You” that is more classic than a teddy bear, flowers, and a box of chocolates. That’s exactly what this gift basket is! If your woman appreciates old fashioned romantic gestures, she will definitely love receiving this gift basket for your anniversary. The bouquet is made up of red roses, red carnations, and purple daisies. 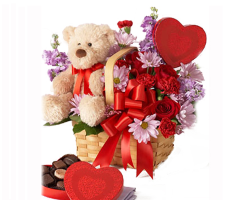 The basket is decorated with a pretty red bow to match the bow around the fuzzy teddy’s bow around his neck and the romantic heart shaped box of chocolates. The Chocolate Lovers Gift Basket has some of the most high end chocolates out of all of the gift baskets we have found. If your woman appreciates good chocolate, she is going to love this gift. She will love the handcrafted chocolate bonbons that come in a classic wooden box, made by L.A. Burdick Chocolates. 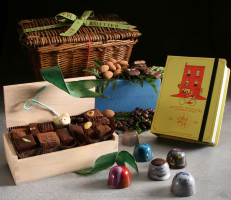 The basket also includes Jewel Box bonbons made by Susanna Yoon from Stick with Me. Each piece of chocolate is hand painted or airbrushed and finished with colored cocoa butters for a high-gloss finish. What an impressive gift to give! 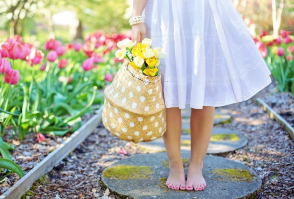 Does your woman simply love being out in her garden? Does she have dreams of growing a garden of her own? 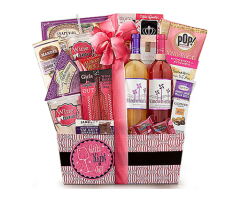 This gift basket is the perfect gift for her! 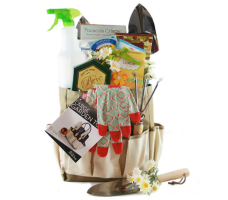 Not only does it come with some of the best essential gardening tools, but this gift basket also comes with some really great snacks for her to enjoy when the day of hard work out in the sun is over. This is an anniversary gift that she will appreciate for years to come, and one that definitely lets her know how much you love her. Does your girl cherish the time she gets to spend with the girls? Sometimes all she needs is a bottle of wine, some yummy snacks, and her best friends to feel like a million bucks. Give her exactly that! Luckily, this gift basket comes with not one, but two, bottles of Moscato! It also has a bunch of treats like asiago cheese, coconut thins, brownie cookies, and much more. She will absolutely appreciate you thinking of her and her friends on your anniversary, and it will only make her more excited to spend the rest of her life with a man who is so caring! If your special lady loves flowers, she is going to LOVE this gift! 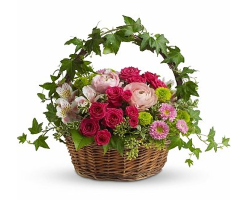 One of the most beautiful floral arrangements out there, the Fairest of All basket is a handled wicker basket adorned with beautiful pink flowers and hand-wrapped ivy. Some of the flowers included in the basket are roses, alstoemeria, ranunculus, asters, button spray chrysanthemums, lush greenery and much more! If you wish, you may also choose the option to add on a teddy bear, chocolate, champagne, or wine for an additional price. One of the most relaxing places to be is the beach. If your girl needs a day to herself to relax and soothe her senses, the Beach Spa Basket is sure to do the job. She will be rejuvenated in no time! 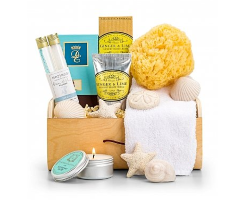 In the crate, she will find all kinds of items that make her feel like she is right on the beach: a sea salt soak, bath bubbles, citrus soaps, ginger and lime hand creme, a sugar cane candle, a Dead Sea natural sea sponge, a premium facial towel, and much more. It’s like a trip to the beach right at home. Let’s face it… men can be so hard to shop for! If your anniversary is rolling around and you just don’t know what to get for him, you are definitely not alone. This year, get him a gift that he will absolutely love. Gift baskets are so unique and fun, even for a guy. We put together a list of the coolest anniversary gift baskets for men. The baskets range from being bee to golf to fishing-themed, and so much more. This means you’re sure to find something that is absolutely perfect for your man. After all, you know him best! In the same way you know his favorite restaurants and favorite movies, you also must know his favorite beers! Your man will be impressed when he receives a basket full of 12 of his favorite beers. The great thing about this basket is that it’s totally customizable with over 150 beers to choose from. The basket even comes with a stainless steel bottle opener, beer holder, and coaster of your choice. There’s no better way to celebrate an anniversary than with a basket of beer! 12. The BBQ Gift Box – Perfect for the Man who Loves to Barbecue! Does your man love to barbecue? Here’s the perfect anniversary gift basket for him! The BBQ Gift Box has everything that an active barbecuer would need. It includes 1849 thick and rich BBQ sauce, a cedar wood grilling plank, all natural liquid smoke, cherrywood smoked sea salt, San Francisco seafood rub, steak & chop rub, Grill mater hors d’Oeuvres snack mix, and hickory smoked BBQ rub. 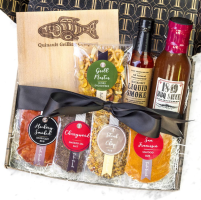 Buy him this gift basket, and let him BBQ a delicious meal for you on your anniversary! Maybe even purchase a high end grill brush to go along with the gift box! What man doesn’t love bacon? This makes for the perfect anniversary gift basket for him. The Sampler Supreme gift box comes with 4 packs of different bacon from Bacon Freak and a bottle of Bogg Hog’s bacon seasoning. It also comes with a box of Boss Hog’s Maple Bacon pancake mix, an interesting twist on your average pancakes. 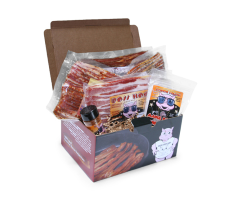 He will be so happy to be able to make bacon inspired recipes with the items in this gift box. Also consider giving him a brand new frying pan with this bacon box, so that he can cook his bacon in style! If you’ve got a man who loves to fish, this is definitely the anniversary gift basket for him! He’ll either be really excited to take the goodies from this gift basket out on his next fishing trip with the guys, or offer to bring you along for a romantic day of fishing together. 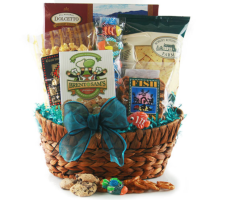 The gift basket includes yummy snacks in an aqua-themed basket. It’s stuffed to the top with tortilla chips, caramel popcorn, key lime white chocolate chips, cheddar pretzels, and chocolate wafer cookies. Want to take it to the next level? You can also purchase him a new, stylish fishing hat for his next fishing trip. Buy him the “Fit for a King” Gourmet Gift Basket for your next anniversary to show him that he is your king! This basket is filled to the brim with all kinds of decadent treats that he will love to snack on. Share the snacks with him at home, or send the basket to his workplace to ensure he always has something delicious to munch on while he’s at work. Just a few of the items inside the basket: Northwoods cheddar cheese round, Tortuga key lime cake, Pasta Partners chipotle ranch pasta salad, Vino de Milo roasted red pepper bruschetta, Dolcetto chocolate wafer squares, and much more! Real men love sweets! 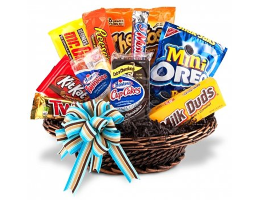 The “Candy Explosion” gift basket will surely bring him back to his childhood, and he will suddenly remember just how much he loves all of these classic candies! He will absolutely love and appreciate your efforts to make him smile on your anniversary with this colorful, overflowing candy basket. Is it Halloween again or are you celebrating your anniversary? Who knows! Also included in the candy basket are treats like Cheez Its, Famous Amos cookies, and white cheddar popcorn. If your guy is a golfer, look no further for the perfect gift. You know what they say about golf–it’s the most intellectually involved sport there is! He must be a smart man, so get him some treats to keep his mind running full speed during the game. 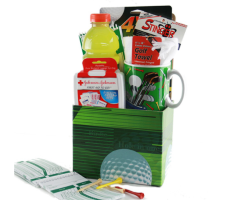 The “I’d Rather Be Golfing” Gift Basket comes compete with everything that he will need the next time he goes golfing: a round file score card, a cotton golf towel, Johnson & Johnson first aid kit, a bottle of Gatorade to stay hydrated, 4 yards more golf tees, and a ceramic golf theme coffee mug. The gift even comes in a golf-themed basket, with a big golf ball printed on it. 18. 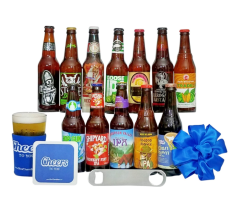 Beer Around the World Gift Basket – A Really Cool Gift Idea! This gift basket is particularly unique because it literally takes the recipient on a trip around the world right from their home! Your man is sure to love this basket, which comes with six craft beers, all coming from different parts of the world: England, Germany, Belgium, Mexico, and China. 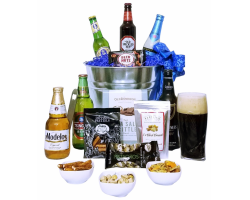 Not only does it include the beers, but the basket also comes with five gourmet snacks for him to munch on while he drinks: dipping pretzels, beer nut peanuts, chocolate sea salt brittle, sriracha peanuts, and pistachios. Searching for an anniversary gift for your parents can be tough. Deciding what’s appropriate for an anniversary that isn’t yours and also finding a gift that will be useful for them is quite the hassle. Don’t worry, we’ve compiled an extensive list of the best and most romantic anniversary gift baskets for parents with all types of different themes and price ranges. Whether you decide to go with a spa gift basket to treat them to an at-home spa day, send them a basket full of yummy fresh fruits, or any other gift on our list–they will definitely appreciate the thought that you’ve given into getting them a gorgeous basket for their special day. For being your parents and raising you all these years, they definitely deserve it! 19. Caffeine Rush – Give Them the Morning Jolt They Need! If you’re looking to buy an anniversary gift for your parents, chances are they have a million things going on in their lives. 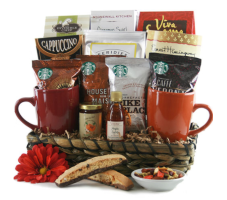 If they both love coffee, this is the perfect anniversary gift basket for the couple. 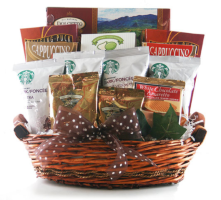 Filled with a compilation of some of the best coffees around, along with an assortment of some delicious cookies, this basket is sure to please. It features Starbucks Coffee, Wolfgang Puck Coffee, Coffee Masters flavored coffee, and even Cappuccino mix. To dunk, the couple will enjoy munching on some Dolcetto chocolate wafer squares and Lady Walton Chocolate waters. Send your parents on a romantic picnic for their anniversary with this adorable picnic-themed gift basket. It will surely be an anniversary that they won’t ever forget! 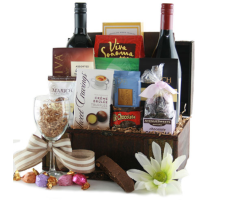 The gift basket ships with two bottles of your choice of wine or champagne. Along with the wine, they will enjoy some yummy picnic snacks, including: bruschetta parmesean sourdough crisps, caramel popcorn, butter pretzels, fruit & nut trail mix, sugar pecans, toffee peanuts, garlic and herb cheese, summer sausage, herb olives, Belgian biscuits, chocolate wafer squares, and wafer squares. Give them the relaxing anniversary that they surely hope to have. This gift basket has the best of both worlds–a bottle of your choice of wine or champagne along with a few snacks, and lots of the best at-home spa essentials. The couple celebrating their anniversary will definitely enjoy snacking on butter pretzels and wafer rolls as they use their pampering goodies. Aside from the wine and snacks, the gift basket also includes a terry cloth bath pillow, a spa relaxation CD, a skin polishing towel, body lotion, body spray, shower gel, body butter, bath soap, and tea light candles. Most of the time, when couples celebrate their anniversary they want nothing more than a day to relax together. Nothing says relaxation like a lovely breakfast in bed. The Breakfast in bed Gift Basket comes with a cozy arrangement of breakfast items that they will love: 2 ceramic coffee mugs, 4 bags of Starbucks coffee, Ernest Hemingway tea, Feridies fruit & nut trail mix, Stonewall Kitchen raspberry peach champagne jam, maple syrup, cappuccino mix, Kerby Buttermilk pancake mix, and Kerby apple cinnamon pancake mix. Take your gift to the next level and even prepare the breakfast for them on the morning of their anniversary! 23. 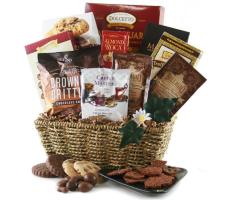 Chocolate Works Gift Basket – Satisfy their Sweet Tooth! Everyone loves chocolate! The classic romantic gift is chocolate, so you can’t go wrong with this gift basket for a couple. With a mix of chocolate and cookies, the pair won’t know what to dig into first. 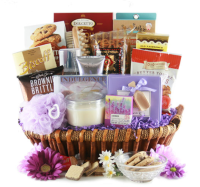 The basket includes luxurious and decadent wafer squares, lemon cookies, hot cocoa, chocolate creme brule, chocolate chip brownie brittle, almond roca, chocolate dipped cookies, and chocolate almonds. Also, be sure to check out the add-ons available for this gift basket! The couple celebrating their anniversary will love receiving this gourmet gift basket containing four handmade raw milk cheeses to share on their special day. 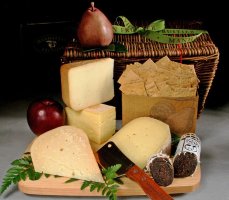 All of the cheeses in this basket are top quality farmhouse cheeses made from raw milk. The basket also includes fresh fruit, whole wheat organic crackers, a cheese knife, and dry fig “salami” to pair with the cheeses. All of the products in this gift basket are high end and sure to impress. Also comes in a deluxe version, in which a maple serving board is included. The perfect gift basket for anyone who enjoys good food and a good time! The items in this basket change based on whats available seasonally. The fruits and snacks are hand-selected by florists to ensure your gift always looks absolutely perfect and stunningly attractive. The couple will surely appreciate receiving such an abundant and beautiful basket for their anniversary, and they will also have a great time trying the goodies in their basket together. 26. 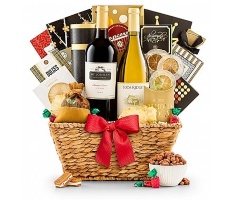 Toast of California Wine Basket – Send them to California Wine Country Right at Home! This special wine basket was created to be reminiscent of the famous California wine country. It comes with two classic California wines, Mt. Josselyn Reserve Red and Soda Ridge Chardonnay. 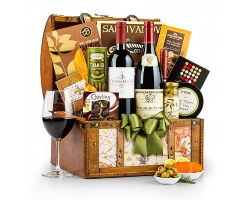 The flavors of these wines are sure to impress anyone who receives this gift basket. 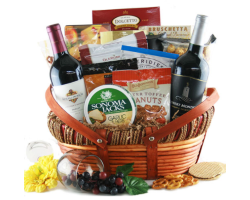 The basket also comes with some snacks to match the wine: pomegranate white tea gummy bears, Almond Roca, crisp pineapple slices, gourmet popcorn, and much more. It is decorated with a hand-tied satin ribbon and a free card with your personalized message printed on it. Two of the most romantic and thoughtful gifts to give are sweet, fresh fruits and beautiful, bright flowers. The fruit & blooms basket has both! 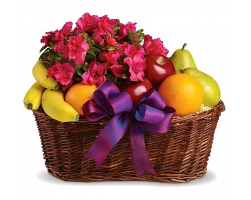 Presented in an adorable wicker basket, fruits like apples, bananas, pears, and oranges are filled to the top along with a potted plant. Fruits and flowers that come in the basket will vary based on what is available seasonally. Also add on a plush teddy bear, box of chocolates, mylar balloons, a bottle of wine, a single rose, or more for an additional price! This junk food basket not only looks super fun, but also tastes like childhood! These deserve to indulge on these sweet and salty treats in honor of their anniversary. 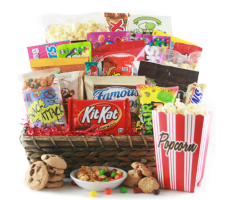 Based on availability, the basket is filled up with assorted candy bars, cookies, and snacks. Some brands that the lucky couple may find in their gift include Oreos, KitKats, Cheetos, Reese’s, and much more. Make the junk food basket more suited for adults by adding a bottle of champagne to arrive with it! 29. Got Cookies? Basket – A Gift Basket for Couples that they Won’t Forget! This is one of our favorite gift baskets we’ve found. 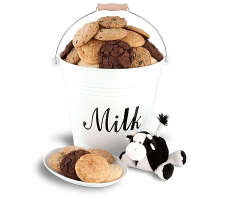 Presented in an adorable milk pail with a plush cow toy, this gift comes with five dozen fresh baked cookies of all different classic flavors. With one dozen of each flavor, the basket includes: chocolate chip cookies, triple chocolate cookies, oatmeal raisin cookies, snickerdoodle cookies, and lemon drop cookies. Every cookie is individually wrapped, which keeps them all fresh for an extended period of time, and ready to be eaten at any time. Buying for a couple who prefers to have afternoon tea rather than coffee? We’ve got you covered! The Full Leaf Tea Tasting Crate takes some of the most wonderful teas out there, made by teamakers Steven Smith and Harney & Sons, and wraps them together in an attractive crate with decorative filling. 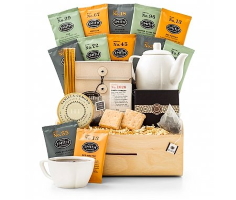 The basket includes a porcelain teapot and teacup, the Steven Smith full leaf and herbal infusion variety pack, some Harney & Sons vanilla Comoro tea satchets, shortbread cookies, and apple blossom honey. Have a couple in mind who is close to your heart? Show them how much you appreciate them by sending them a very special, personalized gift basket! All of these baskets come with enough goodies for two people to enjoy, and they also definitely all set the mood for a romantic and fun evening. 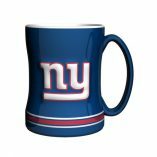 Maybe you are going to a wedding anniversary party, or a wedding, and still need to find the appropriate gift. We’ve got you covered with these! Also, if you couldn’t find a gift basket for your partner above and still want more options, these make for great gifts for individuals. While it may be simple, this adorable wedding gift basket is extremely cute and sends the message of romance. The basket is filled with both sweet and salty snacks that the couple will enjoy together. Some of the items in the basket include: gourmet crackers, white cheddar popcorn, summer sausage, smoked salmon, salmon pate, smoked almonds, Caribbean rum cake, Dulce de leche cookies, and much more! Great idea not only for an anniversary gift, but also as a wedding gift! Anyone who has ever had fondue knows what a great treat it is. Send this sweet gift to the couple celebrating their anniversary to really impress them. 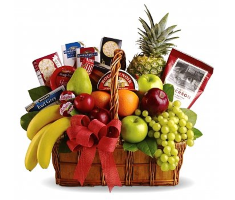 With some of the best quality fruit and the most decadent and luxurious chocolate dipping sauce, the couple is sure to love this basket. 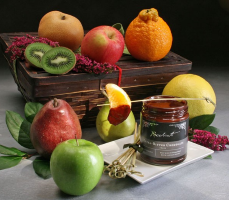 The basket comes with eight pieces of seasonal fruit, wooden skewers for dipping fruit, and a delicious dark chocolate sauce that is finished with vanilla and cocoa powder made in San Francisco by Michael Recchiuti. Cheers to an anniversary! Impress the couple with one of the classiest gift baskets we could find–the Dom Perignon Greetings Wine Gift Basket. The basket includes: a bottle of Dom Perignon champagne, Dolcetto chocolate wafer rolls, bread sticks, Sonoma Jacks cheese, Millie Lacs beef summer sausage, Vision Pack smoked almonds, and Nunes Farms almond crunchies. Worth every penny, this indulgent feast will have them feeling like they are on top of the world on their anniversary! Wine and chocolates are two of the best ways to celebrate an anniversary. This gift basket, luckily, has both! 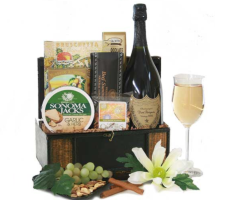 This gift basket includes your choice of two wines or champagne. Also include a personalized message for the recipient for free! Some of the chocolates and sweets that come along with the wine are: Ashers milk & dark chocolates, mint cookie bites, milk chocolate almonds, Godiva biscuits, chocolate caramels, and much more! Know a couple who likes to have a great time? They will absolutely be in awe when they receive this gift basket. The gift comes with a full case of assorted beers. 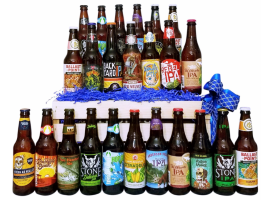 Only the top-rated craft beers from top-rated breweries are selected for this gift basket. If they are beer enthusiasts, they are sure to be impressed by the quality of this product. It even includes a free stainless steel bottle opener, decorative fill, and your very own personalized message. 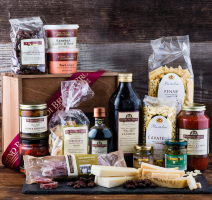 The taste of Italy is always a hit when it comes to gifts. 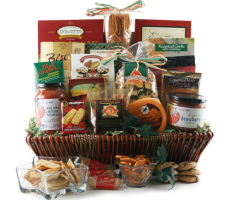 This gift basket has all of the essentials for a great meal when it comes to Italian cooking. 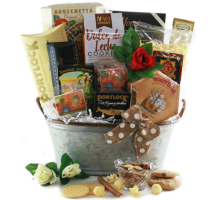 With an olive medley bruschetta, Italian Rotelli pasta, Radiatore gourmet pasta, Italiano seasoning, Formaggio pasta sauce, and tiramisu popcorn for dessert–this basket makes for an entire meal! The couple celebrating their anniversary can even spend their night making an Italian dinner together. It will be an anniversary they won’t forget! 37. 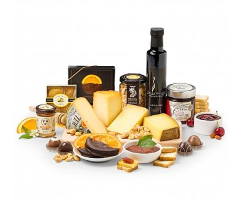 Di Bruno Bros The Cucina Basket – Give them the Gift of Italian Flavor! The Cucina gift basket is one of our favorites because of how much it includes, as well as the high standard of quality Di Bruno Bros holds for their products. 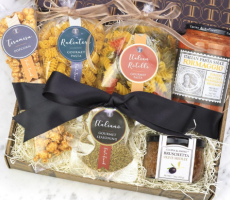 With all of the finest oils, pastas, cheeses, and meats inside, the couple will absolutely love restocking their pantry with the items in this gift basket. Whether they plan to save the basket for making dinner themselves, or use it to make dinner for company, this basket has essentials that every couple needs in their kitchen and they are all sure to impress. Comes in a gorgeous wooden box with decorative filling. Send the couple on a trip around the world without leaving their homes with a special chest containing wines and gourmet snacks that come from different parts of the world. One wine, Tomaresca Red Blend, is from Italy and the other, Louis Jadot Beaujolais-Villages Gamay, is from France. The gift chest also includes: brie cheese, smoked salmon, olive oil crostini, Spanish olives, crisp dried pineapple slices, snickerdoodle cookies, red pepper & feta spread, and much more! 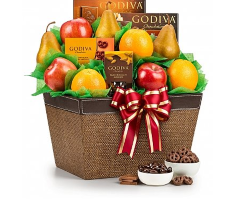 Those who love the sweetness of fresh fruits paired with the classic decadent taste of Godiva chocolate will absolutely love this gift basket. Fresh pears, crisp apples, and juicy oranges are picked at their peak for the basket so that appearance and taste are both at their best. Some of the Godiva products in the basket include chocolate covered almonds, chocolate covered pretzels, and much more! Customize this gift to the couple with your own personalized message or by adding on a bottle of champagne. For those who love the pairing of champagne and caviar, this gift will definitely be impressive. The luxurious taste of gourmet caviar is champagne’s best friend! The gift basket comes in a vintage style picnic case with a hand-tied satin ribbon. Inside, the recipient will find two splits of Domaine Chandon Brut classic champagne, along with premium Saraivanov caviar and savory crackers. The couple will surely enjoy having their champagne and caviar before going out for a romantic anniversary dinner. Give them the gift of great cheese for their next special day. The Premium Cheese Tasting Experience comes in a keepsake isothermic cooler with a personalized card that has your message printed on it. The artisan cheeses included in the gift basket are: Cantalet Dore, Petit Basque, Sottocenere, and Comte Extra. Also included are treats and snacks such as: quince pate, Marcona almonds, barrel aged balsamic, orange blossom honey, petit toasts, and cherry almond compote. Send their taste buds on a trip with this luxurious cheese tasting experience! 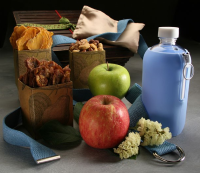 The Maitre d’ Selection gift basket comes packed in a reusable tailored isothermic cooler with a free personalized message card. It includes some of the most premium charcuterie around, including Jamon Iberico de Bellota, Iberico Salchicon sausage, and Olli Spiced Salmon. 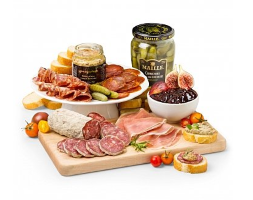 There is no way to celebrate an anniversary that is classier than this gorgeous charcuterie board. The meats even come paired with Maille cornichons, whole grain garlic mustard, and much more. If you’re looking for a way to impress the couple, this is one sure way to do it! 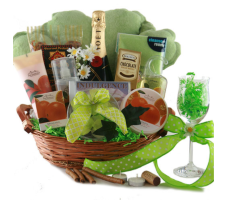 Thank you for checking out our list of The Top 42 Anniversary Gift Baskets. 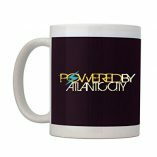 We hope you found the perfect gift for your boyfriend, girlfriend, spouse, or loved ones. 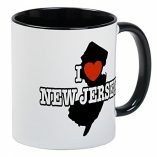 For more gift ideas, check out the Fun New Jersey Store. 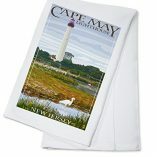 You’ll find really cool NJ clothing and apparel, unique NJ books, and even cool places to go in NJ. Need a gift for a kid’s birthday party? Check out our kid’s birthday gift guide! 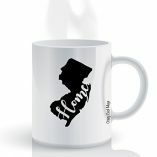 Disclosure: The Shop.FunNewJersey.com Store is an affiliate site where we have partnered with local companies to promote and sell their products through our affiliation. We are proud to partner with the Amazon Services LLC Associates program, which is one of the biggest and most respected programs on the internet. Summer Daidone is a college student interested in writing and traveling. She has been part of the Fun New Jersey team for over five years. In her free time, she loves trying new restaurants, visiting new cities, and spending time with her friends.